In the works for three years, God of War III has finally arrived for the PlayStation 3 as one of the most anticipated games for the Sony console. I really, really enjoyed the first two even with some flaws and some of the more frustrating sequences like climbing up the wall in Hell with the rotating blades. Now, we have what might be the final chapter in the saga of Kratos so has the wait been worth it and is it a worthy end to the trilogy? God of War III takes place right after the end of the last game. For those that don't remember, at the end of the second game Athena sacrificed her life to save Zeus as Kratos was just about to do him in. Kratos learns that Zeus is his father and that he's on the vicious cycle of the son killing the father. 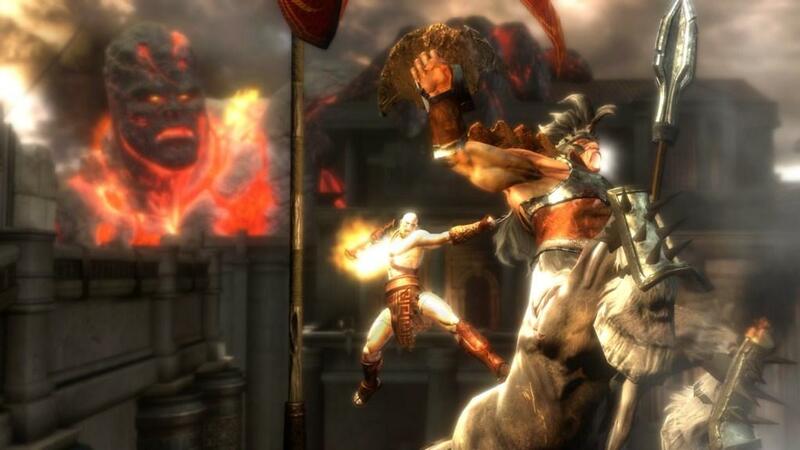 Zeus had hoped to break the cycle by killing Kratos but it didn't happen. 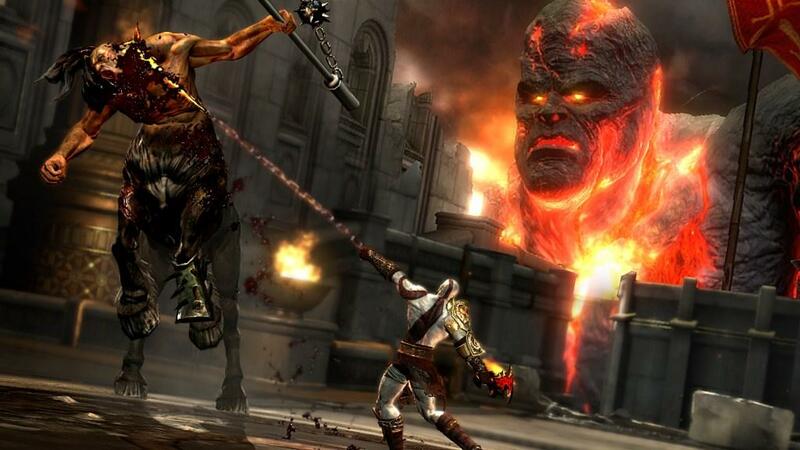 Kratos goes back in time to bring the Titans to his time for one last battle against Zeus and the Gods of Olympus. The end begins with the assault on Mount Olympus by the Titans and that's where God of War III starts right up as you approach the top of Mount Olympus on Gaia. 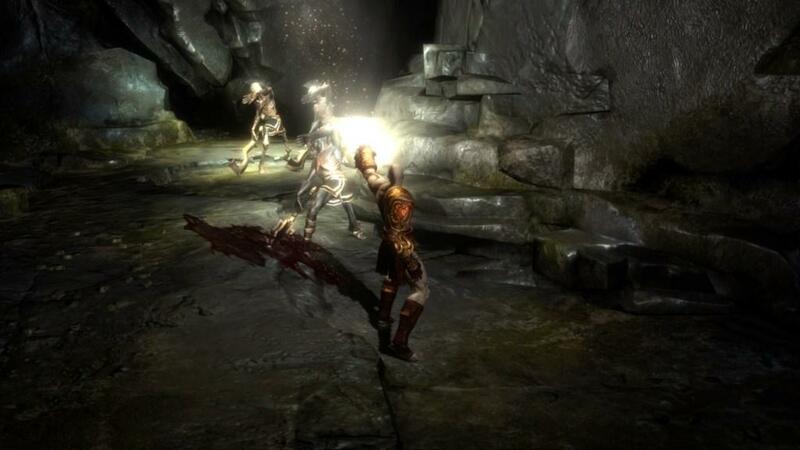 God of War III doesn't muck with the gameplay too much but does add some nice new features. The controls stay pretty much stay the same so those that played the first two will be able to jump into this game without any learning curve. 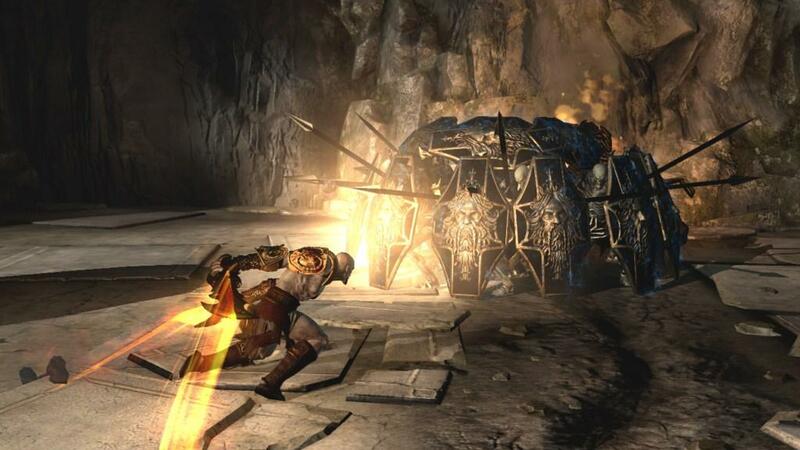 For those that love the massive combos that can come about, God of War III delivers in spades. Swinging from areas with the help of your blades is back and those little points on the map that have that all too familiar white glow show you the way. So let's get to some of the additions to the series. A few new weapons show up for Kratos to play around with and one of those is Cestus. If you played the demo, then you know these lion shaped gauntlets taken from Hercules can be pretty devastating. The Cestus is also used for other purposes as it's not just a powerful weapon to dispatch enemies. Certain portions of the game as well as certain enemies will need the Cestus to be used on in order to get past the obstacle. Apollo's bow, earned in Hades, lets you shoot fire infused arrows that can also serve as a tool to burn down brambles and open up new areas to explore. Hades' Chains are similar to your blades but offer up different combos and moves. A thing you'll notice right away is that your blades' light attack can be used to break apart objects in the world for experience orbs pretty easily but the Hades' Chains won't hit until the very last part of the light combo and even then it seems like it always misses a few things. Also, the spell brought forth by the Hades' Chains allows you to summon up dead souls of various monsters to attack your foe. All the weapons can be upgradeable like in the previous two games unlocking new moves and special abilities. Leveling up the Hades' Chains for example unlocks different souls to conjure up. The final weapon is also similar the blades and chains but is infused with an electrical charge that can do some massive damage. While the leveling system isn't anything complex, it does add to rewarding those that generate high combos or do a lot of exploring for chests and destructible objects with a quicker road to more powerful attacks. You do retain some of the items you picked up from the past games such as the Golden Fleece and Icarus Wings to allow you to glide to certain areas or fly up and away with the help of a vent. You'll also pick up new items such as the boots for Hermes and if you've played the demo, Helios's head. Helios's head is actually pretty useful in terms of finding hidden items, lighting the way, and important in the middle portion of the game against a very powerful enemy. Added to God of War III is the ability to ride certain monsters. The demo offered a glimpse of this where you can hop onto the back of a Cyclops and use his massive attacking ability on your foes. It's kind of a fun dynamic that's explored in a few other areas as well. A more unconventional way to ride a monster involves the harpies in the game. Certain chasms can only be traversed by aggravating one of these flying monsters as to lure her to you, jump up and hold onto her legs, and stab her repeatedly to make her fly to a certain area. You've got a small window of time to ride the harpies so you might need to hop onto another harpy in mid-air to make it all the way across. What I like about the feature is that you're in a fight against the steed to do your bidding against its will. While you pretty much have control over the creature, you'll see a little bit of resistance as the beast tries to fight against your control. You don't do it too much but it does appear in a few instances in the game. Also featured in the demo is the flying sequence where you travel at fast speeds while avoiding beams, falling rocks, and other debris. It happens a few times in the game and it came close to being one of those frustrating sequences to experience after the second time. It's kind of cool to do the first time but can wear a little thin towards the end. Luckily, it only took me a few tries to get through them but it was close to being one of God of War annoying aspects that I disliked about in the first two. 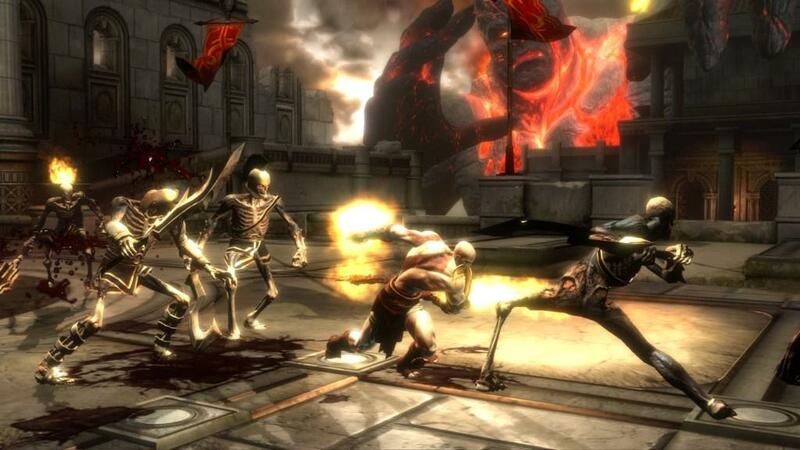 Thankfully, the annoying sequences in God of War III are kept to a minimum and I never spent more than a few minutes in a puzzle area or completing a sequence of events. There aren't many swimming sequences but at least when you are in those areas you don't have to worry about breathing. Also, there's been improvement in moving large items. In previous games, you had to kick it to quickly move the item across the board. Now, if you are pushing an item instead of dragging it, you can build up speed to move the object in place faster. I'm glad Santa Monica streamlined that and also didn't put in any timed puzzles where you had to move an item to a certain area in a fixed amount of time.The levels are now bigger and better than before thanks to the power of the PlayStation 3 and the space provided by the Blu-Ray format. The artists were always great at designing interesting and impressive looking structures and here the team has excelled as well. Going back to Hades, you see a ton of great designs that invoke both the dread of being in the land of the dead as well as the awe inspiring design that's both complex and highly detailed. 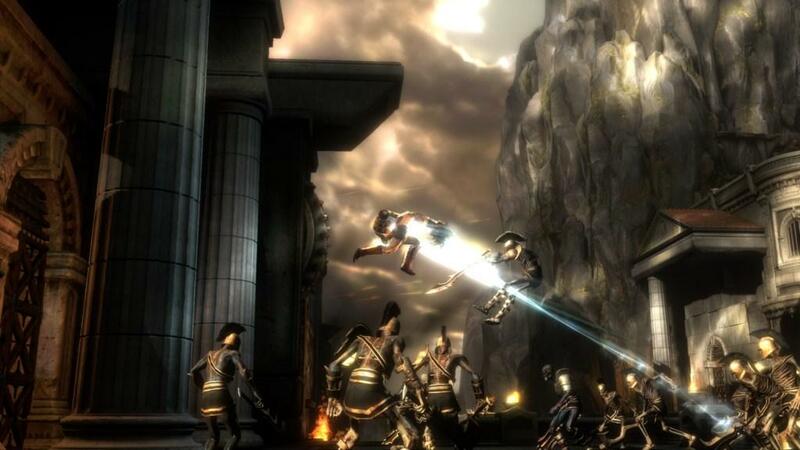 Having backdrops where the action takes place such as a Titan attacking Mount Olympus of Hephaestus forging in Hades really adds to the visual immersion of the game. Sometimes I would just stand there and watch some of the things that happened in the background because they were done so well. Even when there aren't the big objects to grab your attention, the little things the team has done also make for a fun walk through the game. For example, while traversing Hades you'll see bodies fall every once in a while and hear the scream on the way down. It's a small touch but one that breathes life into the level. It's both the little and big things combined together that makes God of War III's environments so awesome. But, some of the most impressive levels do involve large set pieces and large action. Walking around on Gaia was pretty damn cool but that doesn't compare to another Titan sequence later on in the game that was one of my favorites. Santa Monica Studios did a hell of a job utilizing the power of the PlayStation 3 to bring forth large intricate levels. Interjected in between areas of massive killings and bloodshed are puzzles that make you sit back and think a bit. I've always enjoyed the puzzle aspect of the God of War series and here you get some more with some interesting solutions. Manipulations of various environments in different areas of the level are basically what the puzzles entail but the Santa Monica team has presented you with some pretty fun brain teasers along the way. It's always a nice break away from button mashing to just sit back and figure out the sequences of what to do in order to move on to the next part of the game. The puzzles are never really that hard and the game does a good job at presenting you with all the necessary information to get through most of it such as the panning technique of the camera from one area to the next to show you where you should go. I had a lot of fun with the Garden sequence and it was one of the more unique puzzles in the game. I know some folks don't like the quicktime events but the God of War series has thrived on them and the third game's inclusion really isn't that bad. In fact, I like the improvement on the button display when you are called to push one or two. During the times when you are asked to push a button sequence, the main PlayStation 3 buttons are displayed on the screen according to the orientation on the controller. For example, the triangle button will appear at the top of the screen when you need to press it and the X button will appear all the way at the bottom. This makes the quicktime events easier as you don't have to think as much to know which one needs to be pressed. This certainly helps those that aren't too verse in the controller or just get nervous and don't react well to the short amount of time needed to press the correct button. The main bosses in the game still rely on your doing the correct match in order to get past it but most of them have minimize the annoyance found in the previous two games. I rarely had to do a sequence more than once or twice in God of War III, which is a blessing. The story is fun and, of course, violent filled as there's no shortage of blood and intense killings. Of the three, this one's pretty much straight forward in terms of what's going on. Sure there are some minor sub plots and so forth but this is just Kratos exacting his revenge and his story of his quest to take down his father. If you've played past games, you'll see some familiar sites and cameos from various characters. Don't expect anything too deep though. It was nice to see references back to the previous games during certain parts of God of War III. Now, the end seemed to be drawn out a bit for me and I didn't really care for the part before the ending that much. It felt a little long and unnecessary but I understand the developers trying to maximize the impact of all that's happened in the three games. The final sequence, for me, wasn't that captivating but it certainly didn't deter from the rest of the game. The journey to get there though was certainly a ton of fun with awesome cut scenes and great voice acting. God of War always had over the top violence and it returns in high definition with God of War III. It's certainly not a game for the squeamish as such with the first two; you'll get some pretty intense and violent visuals of different types of deaths. One of the more interesting techniques introduced by the third game is the first person view of Kratos giving you a beat down. 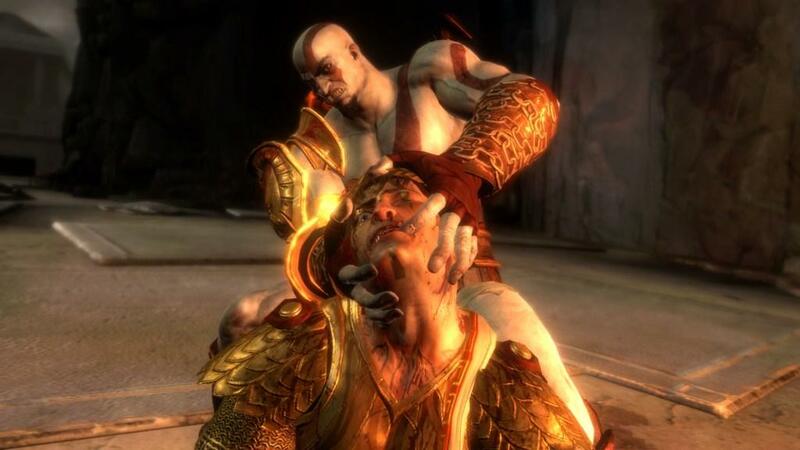 Trust me, after viewing this you'll never want to be on the receiving end of Kratos's wrath. The way you view it, it reminded me of the beginning sequence of Call of Duty: Modern Warfare where you witnessed your own execution but God of War III takes it to another level as you watch yourself get pummeled by the son of Zeus. As usual, the various decapitations, gutting, and bodies being ripped apart should satisfy those with a bloodlust for these types of things. I have to say I was a little put back initially when I saw Kratos do things such as rip out an eyeball slowly from a Cyclops or rip off the head of Helios. I still thought it looked cool though but I just felt so sorry for the victims. 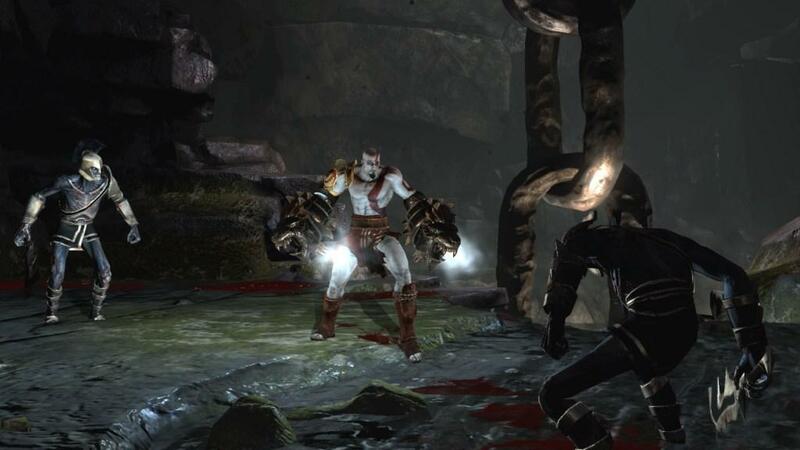 Credit the graphics as seeing the enemies of Kratos being torn apart never looked better and more gruesome than before. Epic seems to be the theme though as evident just with the beginning of the game. Kratos is his ever powerful self from the second game and he has to deal with Poseidon and his watery creatures. Just in this sequence of Kratos taking out the water horse creatures features various sweeping camera angles that includes close ups and far back views of your battle on Gaia. From the first ten minutes you can see how much improved the engine is just by the seamless transitions from wide angle shots to the close ups of Kratos and back to a normal camera position. It's so impressive but you can be overwhelmed sometimes by what's happening on the screen. I mean there's so much going on at once that it's hard to concentrate on what's truly happening but the engine never skips a beat even when a great deal of things are happening on the screen all at once. There's another sequence that I wish I could talk about but seeing as I'm keeping this review as spoiler free as possible, I'll omit the names involved. I'll just say if you thought Gaia was cool, this other one was far and above the highlight of the game for me. From the beginning battle with Poseidon to the end, Santa Monica Studios just does a tremendous job at making important sequences really epic in scale.To say God of War III looked amazing is an understatement. The game just oozes high quality 3D models, textures, and architecture as Santa Monica Studios has really pulled off an incredible feat in producing a visually dazzling game. Let's start with Kratos. His 3D model is such an improvement over the previous two it just doesn't compare. With the increase in polygons, the studio used some incredibly detailed textures to bring Kratos to life on the PlayStation 3. From the muscle striations to the little imperfections in his face and even his large scar on his abdomen, Kratos has never looked so good and the close ups on him really bring out the high quality of work the artists has done. While the other models such as Hephaestus, Hermes, and Aphrodite look good, they are nothing compared to how detailed Kratos looks. It seems like the team put a ton of work into the main character (as they should) while making the supporting cast seem a little bit lesser in quality. Don't get me wrong, the characters are still very well done. It's just none of them compare to Kratos. For example, Hephaestus has a glossier look to him whereas Kratos has more realistic skin. The new monsters that you face are pretty damn cool looking and the engine does a great job at showing off the enemies of Kratos. I liked the Chimera with its three different heads and in true Kratos fashion, you have to finish off each one to take down the monster. What's really cool is that as you destroy each head, the beast changes how it attacks you making it almost three different monster fights in one. Another new monster you'll meet is these rock statues with huge hammers. They're pretty much brutes and can give you a nice hurting but take their hammer for the finishing kill and you'll send them apart into small pieces of rubble. 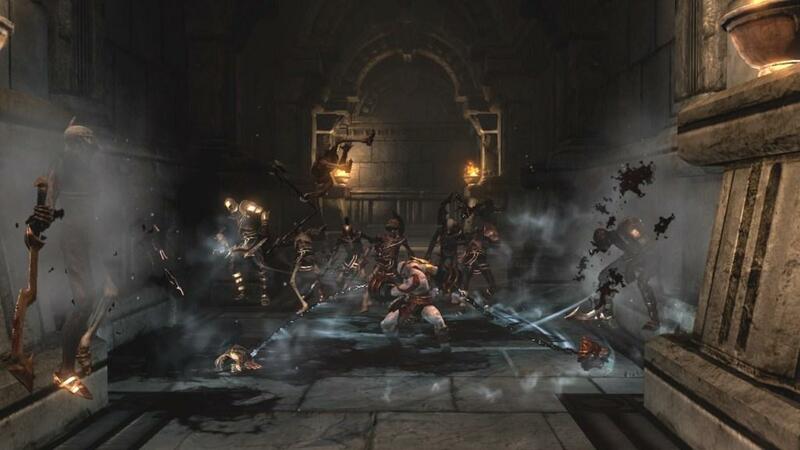 The true terrors though where you'll have the most fun are the boss fights and I think each one stood out well. Even the returning monsters get a nice beautiful face lift. The minotaur looks more powerful and the engine does an incredible job at rendering the detailed hair on the beast. I mean, to even mention how nice the hair looks on the minotaur should tell you how great the game looks and the engine performs. The gorgon moves with such fluid grace and quick action all the while getting an updated look. 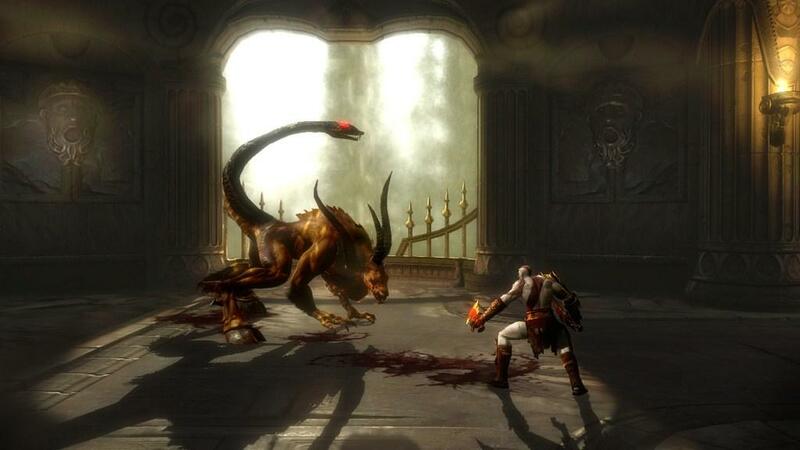 While you may be familiar with what you saw on the PlayStation 2, God of War III just makes the monsters from the first two games much better looking. Accompanying the impressive visuals, God of War III has a first class musical score and high quality sounds. I've always liked the music that sets the mood in the first two God of War games and the third game's no different. I usually turn off the music in any game I play, but God of War III's music is so much fun to listen to and it just does add to every scene in the game. All the voice acting is done extremely well with some appearances by Rip Torn, Kevin Sorbo, and Malcom McDowell. Remember how I mentioned Hercules earlier? Guess who does his voice. Yup, no other than Kevin Sorbo who played Hercules for in the 90s, which I thought was a nice bit of casting. All the sound effects from the weapons to what's happening on and off the screen really add to the first class graphics making God of War III look and sound like one of the best PlayStation 3 games out there to date. I also have to mention the fact that there is so much detail and content about the game, I was truly impressed that I only saw the game in a loading manner twice in my entire time of playing the game. Only twice did I have to wait for the action to start and I think that's just an incredible feat done by the programming team especially since there is no install needed to play the game. God of War III doesn't change up the formula too much. It's still a game with massive bloodshed intermixed with some quicktime events and puzzles. For those looking for more, they will be disappointed as it doesn't bring too much that's new to the series. But, the game's been damn fun for the past two and the third one does not disappoint. It sets the bar high with the visuals and epic nature in its presentation. Fans of the first two will love the third one and it's also a game to really show off the power of the PlayStation 3. If this is indeed Kratos's final chapter then Santa Monica Studios has done an admirable job at sending him off with a bang. It takes the violence, graphics, and sound and pushes it many notches up from the previous games making it a truly worthy title to own and experience. Fans of the God of War series will eat this up. It's violent, visceral, and truly an epic game in both presentation and action. The gameplay doesn't change too much but there are some added items here and there that tweaks it a bit for experienced players. Graphically, there might not be an equal on the PlayStation 3 with the incredibly detailed textures and high quality models.